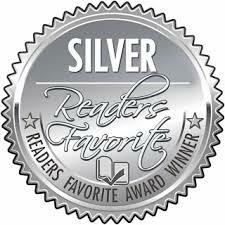 Thank you Scarlett for your support of YA writers and for your contributions to the genre. For those of you who haven’t met the teenage protagonists of my CUL8R [See You Later] series, here’s a little summary of their latest adventure. But can they save Emma? 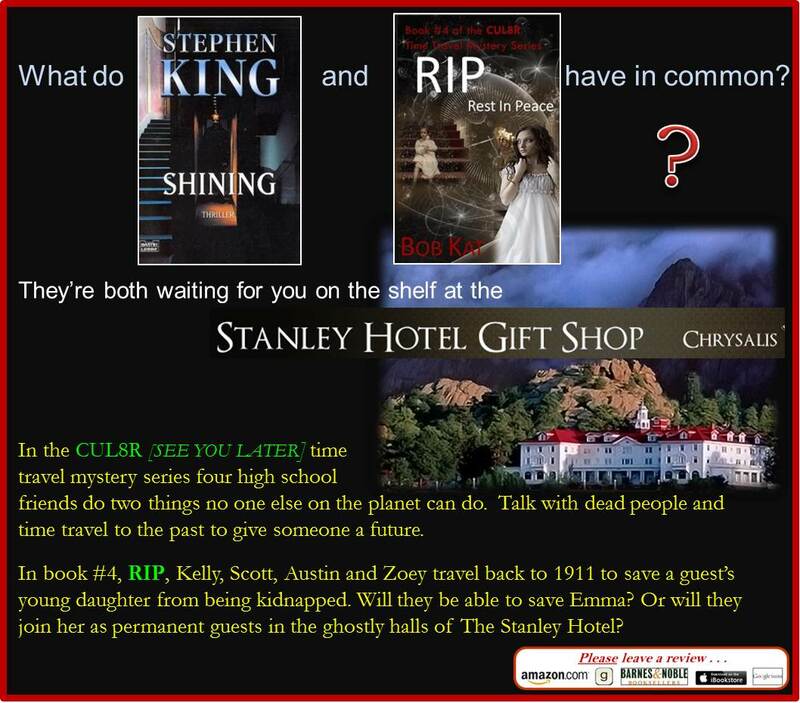 Or will they join her as permanent guests in the ghostly halls of The Stanley Hotel? Hi. My name is Kelly Welch, and I just celebrated my 16th birthday last month. My friends and I have found a way to travel back in time when someone needs our help. So, I guess you could say I live in the present, but I get to see what it’s like to live in the past. So far this summer, it’s been crazy. A drunk driver killed my parents and now I’m living with my aunt in Fort Myers Beach, Florida. I miss my parents with all my heart, but I’ve made some great friends and we’re having amazing adventures. Already this summer we saved a girl’s life from 1966, spent a harrowing few days on an island we thought was deserted, but were nearly killed by a raving maniac back in 1980. The most fun was when we joined a travelling circus in 1927 and kept a teenage boy from being thrown off a train. I loved being around all those animals, especially the horses. But things got really complicated when Zoey and the boy fell in love. And now we’ve just traveled back to 1911 where we’re staying at The Stanley Hotel in Estes Park, Colorado. This was only one year after it was built, and I didn’t think it could already be haunted. But I was wrong. I’m really ordinary with long straight, dark brown hair, hazel eyes and a few extra pounds that I’m trying to get rid of before school starts. Of course, Zoey, one of my new friends is drop-dead gorgeous which makes me feel all that much more plain. For some reason, Austin seems to like me just the way I am. Wow, my heart beats faster when I just think about him. He looks sort of like a young Ashton Kutcher, tall, dark and oh, so handsome. We have a lot of fun hanging out, and he almost kissed me once. I’m sure it’s just fun and games for him, but he’s my first major crush. The trip to The Stanley Hotel was strange and wonderful and scary…but at least I got to spend more time with Austin. I’m both terrified and excited about starting my junior year of high school. I’ve always been home schooled, so it’s going to be a big change. I’ve seen a lot of movies about mean girls and bullying, so I’m a little nervous that I won’t fit in. And I’m really worried that my aunt will find out that we’ve been taking these little trips to the past. We always think they’re going to be easy, but somehow things always get a little crazy and we barely escape with our lives. If anyone ever finds out about how we travel, they’ll take it away from us and we wouldn’t be able to have the fantastic experiences. Ever since we found the Spirit Radio, a Thomas Edison invention that allowed him to communicate with dead people, my friends and I have been touched by the cries for help from people in the past who have unsolved mysteries. I’d like to keep going back and doing what I can to keep these people from losing someone they love. If only I could go back and keep my parents from being killed…but it doesn’t work like that, unfortunately. So, my friends and I will have to careful not to get discovered so we can continue to save lives. 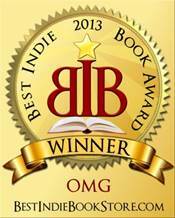 RIP (Rest in Peace) is a romantic story of lost love, new love, mixed with a little mystery and a lot of danger. 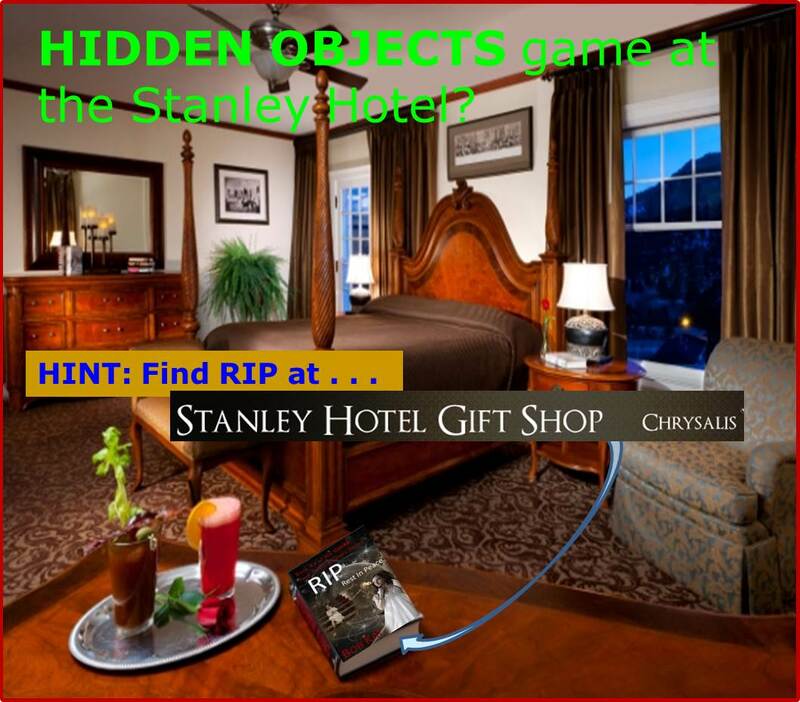 I didn’t believe in ghosts when we arrived at The Stanley Hotel, but I did by the time we left. Here’s a little blurb from the book about my first contact with someone not quite human. 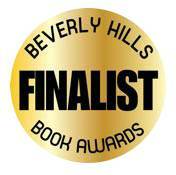 With an unexpected burst of speed, Zoey shot up and ran to the bathroom. “Me first,” she called out before shutting the door. She was walking outside among the guests with Austin. Instead of the severe black and white uniform, she was wearing a soft dress with tiny pink, yellow and blue flowers sprinkled all over it. The material was light and floated around her like a silky scarf blowing in the mountain breeze. Austin, too, was dressed like a gentleman of the era in a tweed jacket and a jaunty driving cap on top of his dark brown hair. He looked even more handsome than usual as he turned toward her and held out his hand. He had held her hand before, but usually just to help her or keep her from falling. 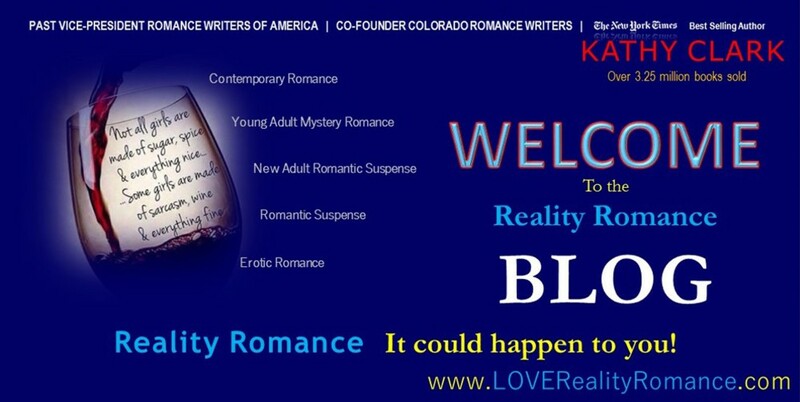 This time, it was just because he wanted to…and that made her heart beat faster in anticipation. She took his hand and savored the way his fingers wrapped around hers. No wonder he was the star quarterback with fingers so long and strong. He tightened his grip. Abruptly, she woke up and bolted into a sitting position. Her hand was throbbing and as she looked at it, she saw that it had the red outlines of someone’s fingers on the back…fingers much smaller than Austin’s. They both looked around. The door was still locked, and there was no one else in the room. RIP (Rest in Peace) by Bob Kat is self-published on Amazon.com just in time for the Halloween season. There’s no better way to celebrate the holiday than to curl up with a great ghost story…but keep the lights on. 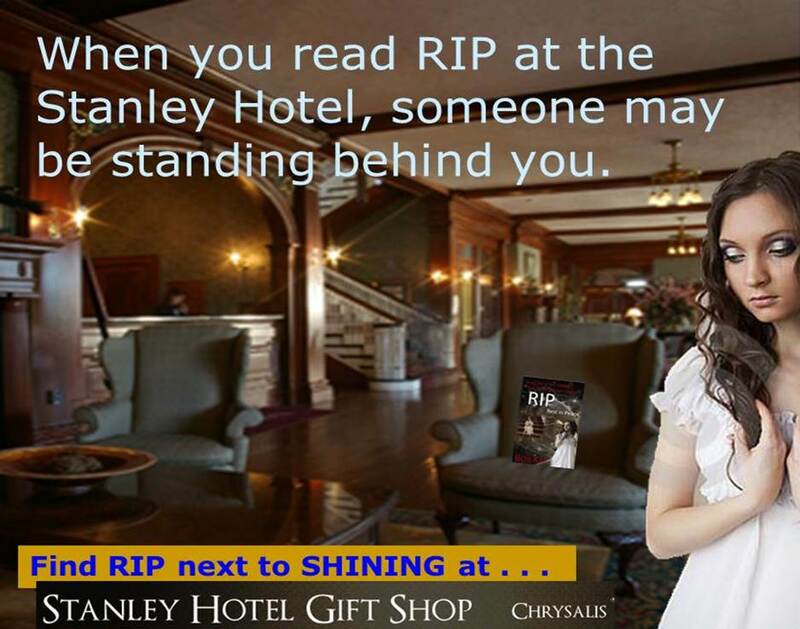 What does Stephen King’s #SHINING have in common with RIP, Book #4 in the CUL8R Time Travel Mystery Series? Well, now it’s official! We’re on the shelf with Stephen King’s #SHINING…STARTING JULY 4th. Travel back exactly 103 years and join Kelly, Scott, Austin and Zoey as they try to avoid the kidnapping of a guest’s daughter. BEWARE: No One has figured this story out. 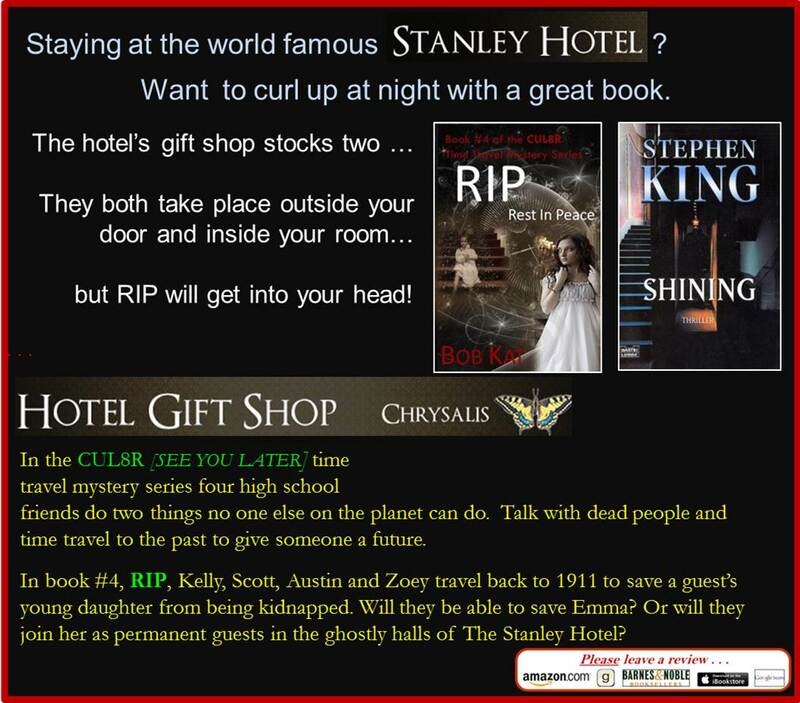 …and if you photograph RIP next to Stephen King’s SHINING in the CHRYSALIS Gift Shop AND if it’s first picture we receive, you will win a $20 Amazon gift card. Here’s some of the early marketing to tempt people to take the pictures and purchase the book…let me know what you think. I’m too close to the opportunity.